The world of motor racing in 2017 is vastly different than the era in which legends like Mario Andretti, A.J. Foyt, Al Unser and Johnny Rutherford carved their place in the up-and-coming ranks. All too often in modern motorsport, the deciding factor in a driver’s career falls within his pocketbook instead of the talent found in his hands and eyes. Worthy wheelmen wash up in the lower levels of development driving as the funds run out before reaching series in which their efforts can be fully recognized and appreciated by professional talent evaluators. In these times of pay-to-drive rides, Mazda Motorsports is bucking the trend by sponsoring the Mazda Road to Indy ladder series and providing promising young talent the opportunities to advance on the merits of their own talent. The best example of these efforts? Look no further than 2017 USF2000 series champion Oliver Askew. A five-year karting veteran and multi-championship winner, the 21-year-old Askew was staring at the edge of his racing career when he was invited to the 2016 Mazda Road to Indy Scholarship Shootout, a competition where nearly 20 drivers from around the world fight for a $200,000 scholarship to drive in the following season of USF2000 racing. Askew notes that reality with purpose, as he made the most of his appearance in the 2016 Mazda Road to Indy Shootout. Defeating talents such as Niall Murray, Trenton Estep and Oliver White, it was Askew who won the scholarship and a ride in the 2017 USF2000 campaign. Askew swept the two USF2000 races at Indianapolis in 2017. All he did after that was win the USF2000 championship, catapulting him to the next step in the Mazda Road to Indy ladder with another series scholarship and the chance to compete in the Pro Mazda championship in 2018. Very aware of the impact Mazda has made on his career to this point, the talented Askew still finds himself in a state of amazement when realizing his rapid ascent over the last two years following many years of hard-fought competition in karting. “It is crazy to look back and think about the ‘what if.’ Thanks to Mazda Motorsports, I was able to continue my dream of becoming a professional racing driver in the Verizon IndyCar Series,” explained Askew. Earlier in December, Askew’s Mazda Road to Indy Shootout story completed its one-year journey as he was asked to return to the competition – this time as a judge. Just as the previous year when his career was in limbo, Askew was on the panel of professionals that would decide the fate of one lucky driver and allow them to join the Mazda Road to Indy ranks as a factory talent in the USF2000 series. 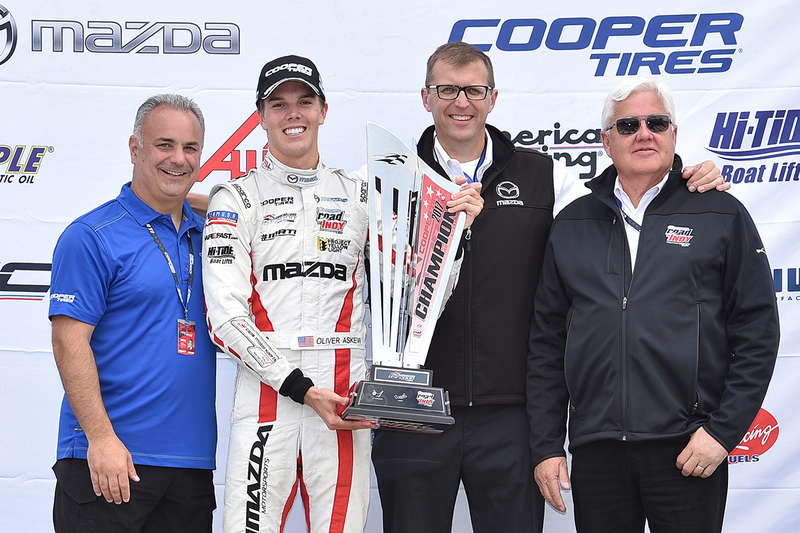 Joined by the likes of IndyCar winner Scott Goodyear, Pro Mazda championship winner Victor Franzoni and Mazda drivers Jonathan Bomarito, Andrew Carbonell and Tom Long, the wide-eyed Askew relished the opportunity to determine the next scholarship recipient. 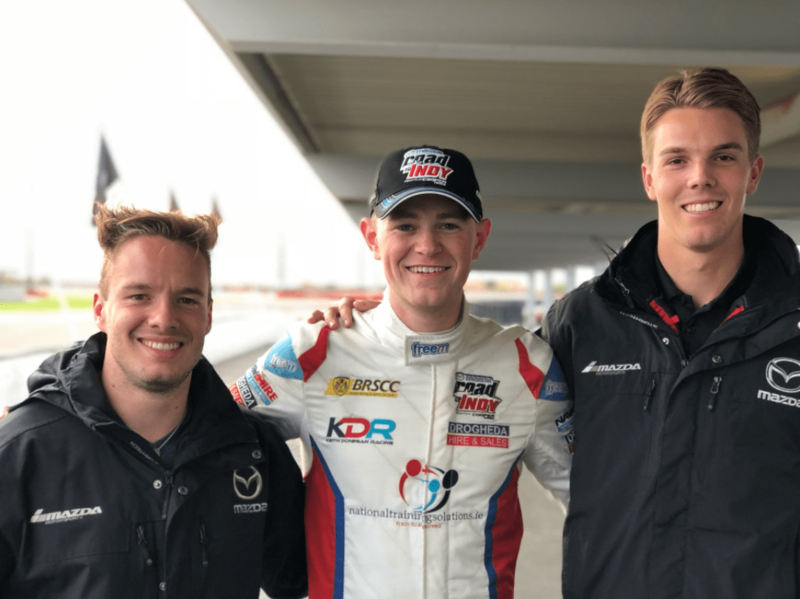 At the end of a grueling two-day competition at the Bondurant Racing School in Chandler, Arizona, the panelists awarded Ireland’s Keith Donegan the 2018 USF2000 championship scholarship and continued a long line of incredible stories within the Mazda Road to Indy. Askew will not compete against Donegan next year, as his 2017 championship in USF2000 catapulted him to the Pro Mazda championship in 2018. Still finalizing plans for a ride, the Florida native Askew is focused on a couple areas of improvement in order to continue his rise through the open-wheel ranks. If he continues as this current pace, there is no reason to believe that Askew will fall from the top of the leaderboards next season. Working diligently throughout this offseason, look for him to pick up where he left off in 2017. As any good driver realizes, the competition of motor racing never really ceases. There is always work to be done and adjustments to be made for the next time on the track. In realizing this reality, Askew is on his was to another successful in in 2018 and beyond. Images courtesy of Mazda Motorsport and Oliver Askew.